Is World-5050 a Scam or Legit? Read Reviews! 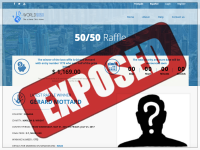 World-5050 Exposed — When Will the Next Lottery Game Start? It doesn’t come simpler. World-5050.com is a 50-50 game where the jackpot is split between a charity and the winner. That’s the “give a chance” and “get a chance” part of their tag line. This game is played weekly with a guaranteed winner as the winning ticket comes from the tickets purchased. Though it seems pretty simple, I want to see the small print. If you haven’t played a 50/50 game before, theoretically 50% goes to the winner and 50% goes to the house. In this case, World-5050.com takes 30% off the top to cover “administration fees and philanthropic investment”. I get the administration, but I’m not so sure about the philanthropic investment part. So 70% of ticket sales are split 50/50. 50% of that goes to the winner and 50% goes to a nominated charity. Tickets are sold 3 for $5, 7 for $10, 20 for $20 and 70 for $50. The odds and the jackpot all comes down to how many people play. Tickets are supposedly sold up to Thursday until 9:00 pm Eastern Standard Time. More on that shortly. The winner’s name is posted on their web site along with the final total of the jackpot. The last one that took place was won by a Canadian to the sum of half of $1,169.00. Okay, that’s definitely not a mega jackpot like US Powerball. Who Can Play at World-5050? It looks like there are no limitations on who can play here, hence a Canadian winning. Players have to be 18 years or older. If you don’t claim your prize within 30 days from the draw, then it will be donated to the charity named on that draw. Oh, and it can take up to 30 days to get your prize. Winners get their prize by wire transfer. There is no information on whether the fee comes out of your winnings or their administration costs. World-5050.com is available in French, English and Spanish. There is a snail mail address and an email address which they say they will respond to within 24 hours. It is owned by GAC Group Limited, a company registered in and with a head office in the Isle of Man. One of the stranger things is the fact that they have been issued a certificate by the Kahnawake Gaming Commission, which allows them to “carry on interactive gaming related activities within and from the Mohawk Territory of Kahnawake”. So, it looks like though the company is registered in the Isle of Man, they have their license covered by an Indian territory in Canada. Would you mind rating World-5050.com ? The simple fact that the last game has been over for a while and the next not started yet is enough to look elsewhere. Add to this the size of the jackpot. Okay, nice idea to add part to the charity, but that’s enough to get me to play – well, if there was a game to actually play right now. When Is the Next Game Going to Start? This site gets a thumb’s down simply because as of today there still isn’t actually a game to play.